After you have your custom cookbook, you need to run the recipes on the appropriate instances. You could run them manually. However, recipes typically need to be run at predictable points in an instance's lifecycle, such as after the instance boots or when you deploy an app. This section describes a much simpler approach: have AWS OpsWorks Stacks automatically run them for you at the appropriate time. AWS OpsWorks Stacks supports a set of lifecycle events that simplify running recipes. For example, the Setup event occurs after an instance finishes booting and the Deploy event occurs when you deploy an app. Each layer has a set of built-in recipes associated with each lifecycle event. When a lifecycle event occurs on an instance, the agent runs the associated recipes for each of the instance's layers. To have AWS OpsWorks Stacks run a custom recipe automatically, add it to the appropriate lifecycle event on the appropriate layer and the agent will run the recipe after the built-in recipes are finished. For this example, you need to run two recipes, dbsetup.rb on the MySQLinstance and appsetup.rb on the PHP App Server instance. You specify recipes on the console by using the cookbook_name::recipe_name format, where recipe_name does not include the .rb extension. For example, you refer to dbsetup.rb as phpapp::dbsetup. On the Layers page, for MySQL, click Recipes and then click Edit. 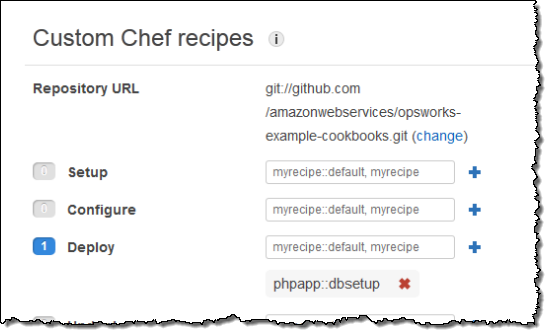 In the Custom Chef recipes section, enter phpapp::dbsetup for Deploy. Click the + icon to assign the recipe to the event and click Save to save the new layer configuration. Return to the Layers page and repeat the procedure to assign phpapp::appsetup to the PHP App Server layer's Deploy event.